There sits a village perched between two hills. Here flows a river so pristine people would sing eulogies in its name. 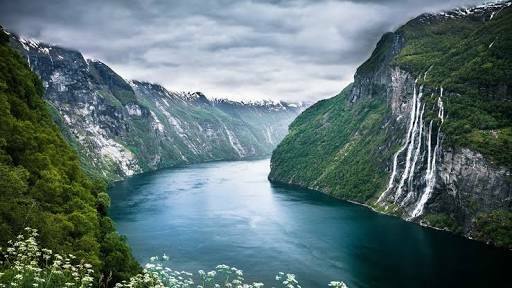 Some hundred families populate either side of this mighty river which they say directly descends from the heavens as a gift for their virtuous deeds in the previous life. The village on either side ends into an impregnable forest thus, effectively severing all contacts with the world that lay beyond. In the local mythology, humanity was a group of two complaisant tribes living in harmony in the land of Gods. It was the unrelenting wrath of the Gods on one man’s folly that would banish entire humanity on Earth. Humanity was then doomed to wander on Earth until they could identify the group to which this debauch belong to. “Every dweller of this land is commanded in the name of our mighty lord; they must maintain a distance greater than twelve hands from our mother- river, the sustainer of humanity, on every seventh day of week from the break of the dawn to dusk. Any man found in breach of this Godly decree shall be dealt fittingly. As if it weren’t enough, the high priest chose to inscribe this new tyrannical decree at every lane of the village; and finally to assuage his megalomania he had one inscribed on a gilded parchment that he’d always carry with himself. “You surely won’t die mother. We’ll do something, the remedy that medicine arrives tomorrow once the weather becomes tenable. Mother you’ll live.” A stinging pain sweeps his throat, almost at the verge of breakdown he somehow gathers strength to withdraw from his mother’s bed. It’s been ten days since his mother first fell ill. With each passing day her condition has worsened, she’s almost emaciated; a husk of her earlier self. Drunk villagers were dancing in debauchery, “The Gods must be equally ebullient in the heavens, don’t know what they have for wine up there, I’ll surely make them taste our wine!” rambled a young man almost passing out. “This is the time, I’ll strike & before these wretched would raise alarm I’m gone.” With his bucket ready he crawled through the palisade, into the twelve hand forbidden distance near the holy river. “Your mother lives only if she drinks the holy water; the water of seventh day!”, the words of the old ascetic. He slowly pulls the bucket out of the river & as he does so tears run down his eyes,“ My mother lives, She won’t die as father!” . As he helped himself on feet, quickly trying to clean off his soiled cloth. “Tie his hands immediately”, instructed the man in a thick accent to his accomplice. “We’ll take this heathen scum to the high priest, he’ll reward us handsomely”, grinned the man. Surely, the Gods & the high priest were pleased; this was his seventh catch over three months. “Slay the infidel! Scythe his head!”, The frenzied crowd cheered as the two men dragged him across the muddy lane towards the pedestal of the sacrificial altar. Six sacrifices in a span of three months surely, his people were awe- struck & the Gods pleased. Nothing could actually belie this satisfaction not even the gravity of his demeanor which he had crafted meticulously over three decades of his rule. The high- priest was ruling with an iron hand & this new Godly fiat has finally helped him crush voices of dissent. “God willing his rule shall prosper”, chuckled the high priest. Two stout men helped him into the palanquin as he left to pronounce a verdict on this sinful act. “Steady the palanquin!”, commanded the high priest to his bearers as he looked through the diaphanous screen, “ It’s twelfth day, when will this unrelenting rain cease. Verily, it’s a divine punishment for our sinning ways. This verdict would serve as a reminder to all people of my land; they must expiate for their sinful ways”. The palanquin finally arrives at the sanctuary; the abode of Gods. It was again an idea of his astute mind to build a sanctuary near the holy river serving two purposes; to appease the Gods & second to enamor his people. Now, as he grew old & frail he realized how important it is for a ruler to maintain an aura of his rule. “Enough of this, no one utters a word. I, the chosen slave of Gods stand here to serve justice. This heathen scum chose to defy the heavenly decree of our Lord. Despite warnings & admonishments, it’s the seventh breach of our sacred law. Surely, the Gods must be displeased & that’s why it rains incessantly for the past twelve days; a reminder of God’s wrath on our lecherous people.” In the midst of his harangue he broke to catch a breath. A sudden realization dawned him, he was no more his younger self; these years had finally begun to corrode him. Still his resolve & faith in his God always grew & has always been unwavering. “ I, in my love for this village & my people have always overlooked your misdeeds just as a father always wishes that his children would make amends & never go astray. Verily, my love for you all was misplaced & that’s why the Gods are angry in the heavens. No more shall I tolerate your lechery”. Again as he stops to steady himself, the crowd stood in utter bewilderment unable to comprehend what was to come. Gathering all his strength the high priest was ready to enunciate the verdict, “Bring the infidel now!” as he said this, guards would bring the man near the raised platform of the altar. The man was sweating profusely. He’d now never get a chance to atone for his sins & his mother would surely die either of her illness or on hearing his disgraceful act. He really wished, God would spare his mother of ignominy that awaits & bring her a quick death. The high priest gestured through his hand, the executioner; a mountain of a man moved towards the altar, his machete shining in the full moon. “Until now I had always ensured death be quick & easy for every transgressor. No more, the executioner is commanded to make this a fitting example for every sinner who lurks in the crowd & for the faithful, this is a spectacle they must rejoice, God’s providences are bountiful. Justice is served!” As he concluded this the high priest moved towards the palanquin, it was already time for his nocturnal prayers. A vestige of its gay days, the village lies abandoned; the great flooding after twelve days of unrelenting rain last month utterly obliterated the village. As the river recedes to its normal course, mangled bodies of men & beasts lie in harrowing postures everywhere. It has turned a feast for pariah dogs never accustomed to such a glut of flesh that too of humans. Those who survived where left to fend for themselves, with little food, contaminated water & diseases everywhere it was better to die at once than endure this calamity each day. Packing the remainder of his belongings he was ready to depart for highlands with the survivors. “It is better mother passed away quietly. She’d have never survived this onerous journey to the highlands. ” he contemplated as he looked across the window ; welcoming the first light of Sun. Sometimes, as he’d reflect on the happenings of past month, he’d often fail to understand God’s providence. The sudden flood that inundated sanctuary as the executioner sharpened his machete one last time before severing his head, the cries of villagers as they were swept in the mighty waves & that wretched palanquin carrying the high- priest grinded to dust. Maybe God had a message in everything, it was his divine retribution on his village fraught with absurd traditions & hypocrisy where people danced in revelry to appease Gods heeding every nonsensical fiat of the high- priest yet none would follow the basic tenets of humanity & compassion. Today as he undertakes this arduous journey to the highlands, the survivors are all brethren, equals to each other. “Justice is finally served!” he sighed looking up towards the azure sky as he & other survivors passed through a narrow track perched across a valley.